A woman finds a treasure and is torn between two men: one who wants to sell it and one who wants to gift it to Greece. A self-righteous missionary man seeks to save the soul of a former prostitute. A Millionairess and a doctor cannot marry until they meet conditions set-up by their respective parents. In New Mexico, a cowpoke forces a banker at gunpoint to give him a loan without collateral, in exchange for an IOU but the marshal and his posse chase after him. During WW2, a French woman living in England volunteers to work for British Intelligence in Nazi-occupied France. An adventurous love story that will live 'til the seas run dry! Victor Parmalee: You'll dive with Calder - dive all over the Aegean Sea. Except in one spot: the spot with the boy on a dolphin. Victor Parmalee: [Cutting her off] Dive until he runs out of patience, runs out of ambition, out of money, out of oxygen, and hope! Phaedra: [Tapping her finger to her temple] Oh, Mr. Parmalee, you have plenty of noodle, you know? Phaedra: Now, we all have wine! An exotic on-location underwater thriller! 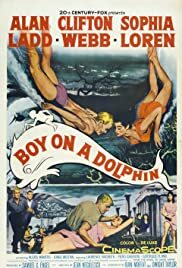 This film was one of 1957's top grossers mainly due to the fact that in those years the public wanted exotic European location shooting and the film certainly does a good job of showing Greece and Sophia Loren who is ravishing.The story is a thriller.Alan Ladd plays a archaeologist ,Sophia a poor sponge diver and Clifton Webb an unscrupulous collector of art.The plot is not really that important.What counts is the scenery and Sophia.Alan Ladd whom I have always considered as a very good actor, but underrated by critics does a good job,like always(he always tried his best), all the more so that his partner was really very much taller than him and he suffered from that.I don't understand why everybody made so much fuss about Alan Ladd's size.He was just as short or tall as Humphrey Bogart or James Cagney or even George Raft.The film is very enjoyable.